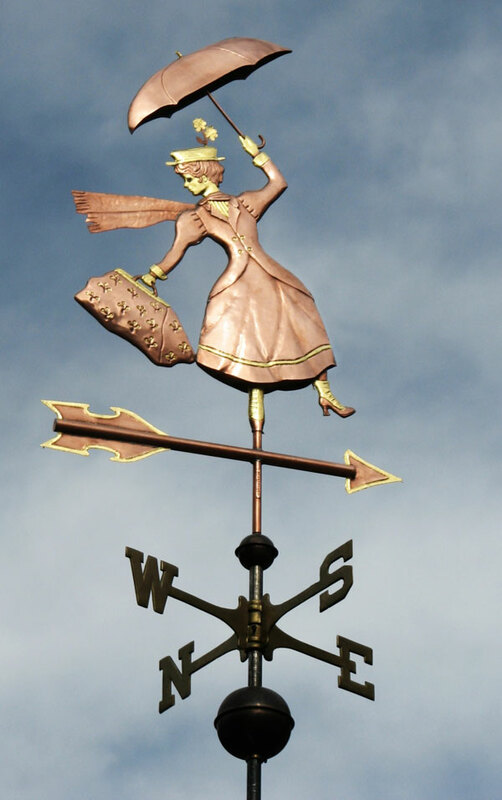 This Old Woman Who Lived in a Shoe Weather Vane is part of our storybook series. 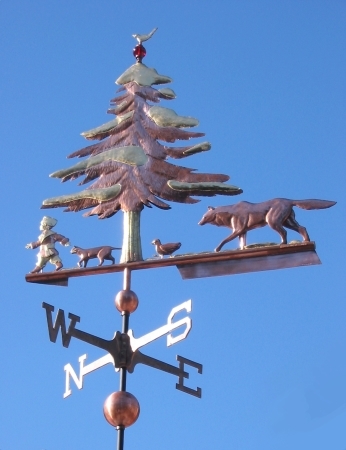 It has been a particularly popular weathervane with daycare centers and preschools. We often stamp the name of the facility in small letters onto the weathervane enabling it to be written off as an advertising expense. 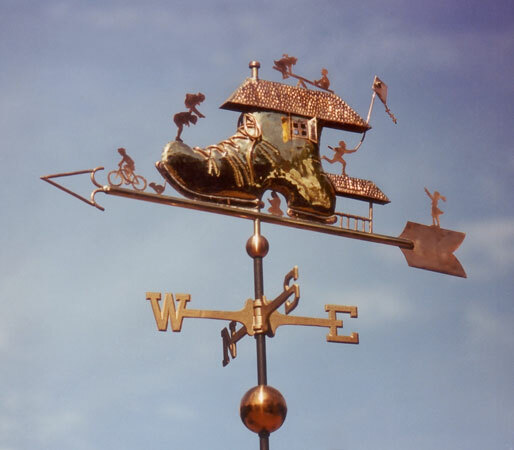 One child care provider told us that her business was located in a competitive market and that after she put her new weathervane up, all she had to do was mention that hers was the center with the Old Woman’s Shoe on top and prospective parents knew exactly which day care facility was hers! 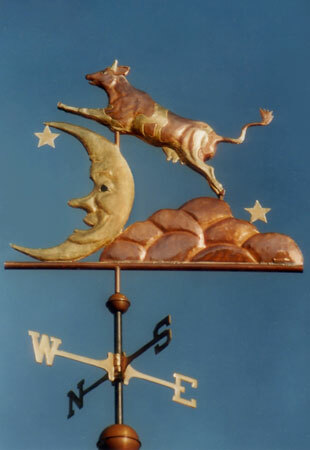 There is a century old tradition of including ‘Lucky Pennies’ inside a weathervane for good luck. We have collected pennies here at our studio for almost every year dating back to 1900. As long as it is not a rare or unusual penny, if you tell us the years that are special to you and your family, we will include those ‘lucky’ pennies inside your weathervane. This is a popular design for large families, and having the pennies for each family member sealed inside is a heartwarming touch. 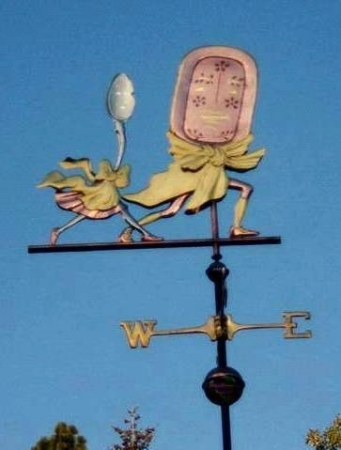 We can personalize the weathervane further by modifying the ‘personalities’ of the children. For example, instead of the boy riding his bike, he could be playing with a kitten. Instead of the little girl reading a book, she could be riding a skateboard. If you’d like, we will also stamp the name of each family member onto a plaque attached to the weathervane. As shown here, in addition to the brass shoe, we have included eight copper kids and a dog, copper roofs, shoe laces and an arrow. 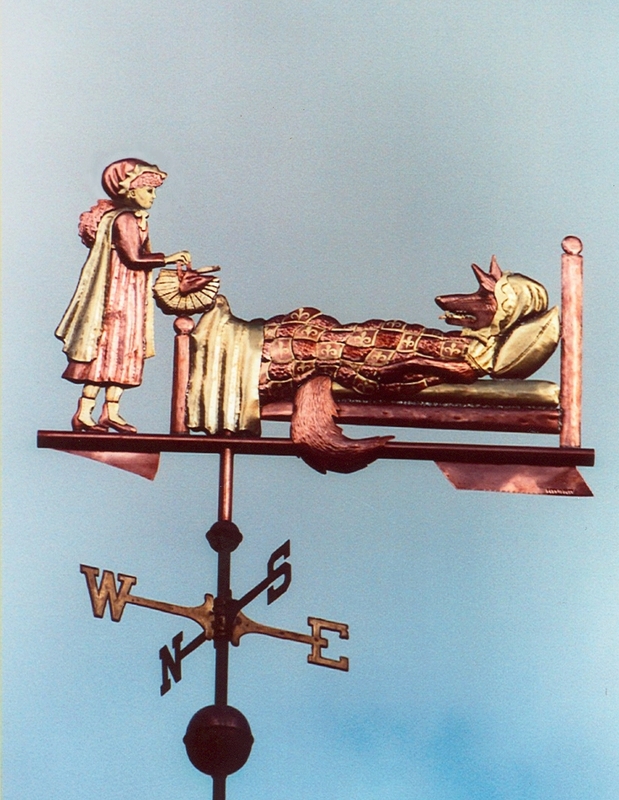 This weathervane looks particularly nice when we add optional gold leaf to each of the children. As the copper and brass weather, first a rich chocolate brown color and then eventually a beautiful turquoise green, the children stand out in bright contrast, making an active scene just a little more lively. 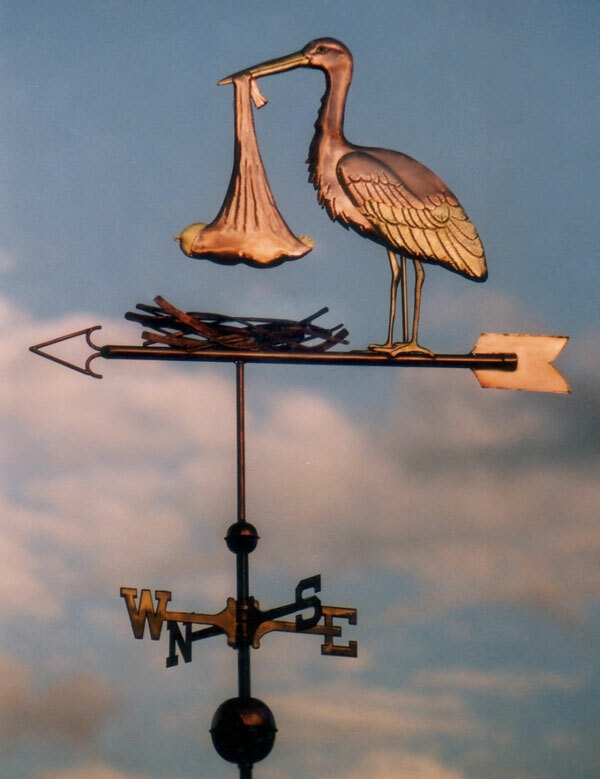 Since we make each weathervane to order, you are welcome to pick the metal combination that most appeals to you.